MascotShows is made of high quality Coral fleece or flannel,it is so cozy and warm when you sleeping. You can wear it to the party,and you will become the focus of people. 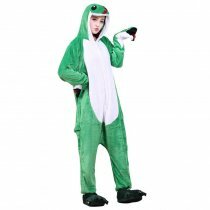 The creative personality of cartoon conjoined pajamas are popular now and it is essential to tide male and tide female.So you have? These clothes are loose and comfortable,both men and women can wear.Of course as a gift to other is good choice. Details - The adorable and eye-catching animal bear pajamas costume designs all feature a hood with eyes, teeth, and nose for full effect. Matching tails and chest designs help complete your ultimate cosplay look! Match with a pair of animal shoes (not included) for your next pajama party. Cozy - A special blend of comfort and fun, these flannel materials are soft to the touch and will keep you warm during those cold winter months. The button up closure allows you to quickly get dressed while the loose fit gives you the flexibility to easily wear over your existing clothes or jacket. Versatile - Loose fitting materials allow you the flexibility of movement while maintaining style and comfort. The fun and whimsical designs will make sure you get noticed at your next furry convention or party. Carry your remote or keys around with you thanks to two front pockets.